Kokoras is an internationally award-winning composer and computer music innovator. Born in Greece, he studied classical guitar and composition in Athens, Greece, and York, England; he taught for many years at Aristotle University of Thessaloniki. Currently, he is an Associate Professor of Composition at the University of North Texas. 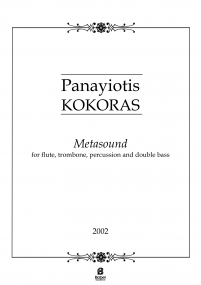 Kokoras's sound compositions use timbre as the main element of form. His concept of "holophony" describes his goal that each independent sound (phonos), contributes equally into the synthesis of the total (holos). In both instrumental and electroacoustic writing, his music calls upon a "virtuosity of sound," emphasizing the precise production of variable sound possibilities and the correct distinction between one timbre and another to convey the musical ideas and structure of the piece. 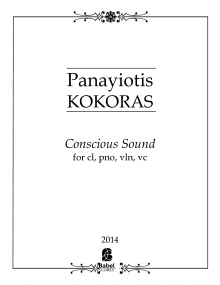 His compositional output is also informed by musical research in Music Information Retrieval compositional strategies, Extended techniques, Tactile sound, Augmented Reality, Robotics, Spatial Sound, Synesthesia. His compositional output consists of 62 works ranging from solo, ensemble and orchestral works to mixed media, improvisation, and tape. His works have been commissioned by institutes and festivals such as the Fromm Music Foundation (Harvard), IRCAM (France), MATA (New York), Gaudeamus (Netherlands), ZKM (Germany), IMEB (France), Siemens Musikstiftung (Germany) and have been performed in over 600 concerts around the world. His compositions have been selected by juries in more than 230 international calls for scores and have received 67 distinctions and prizes in international competitions, among others Franco Evangelisti Prix 2012 (Italy), Destellos Prize 2011 (Argentina), Prix Ars Electronica 2011 (Austria), Métamorphoses 2010 & 2000 (Belgium), Giga-Hertz Music Award 2009 (Germany), Bourges 2009, 2008 and 2004 (France), Gianni Bergamo 2007 (Switzerland), Pierre Schaeffer 2005 (Italy), Musica Viva 2005 and 2002 (Portugal), Gaudeamus 2004 and 2003 (Holland), Jurgenson Competition 2003 (Russia), Takemitsu Composition Award 2002 (Japan). He is founding a member of the Hellenic Electroacoustic Music Composers Association (HELMCA) and from 2004 to 2012, he was a board member and president. He is currently secretary of the Interactional Confederation of Electroacoustic Music (CIME/ICEM) and Conference Chair for the ICMC 2015.